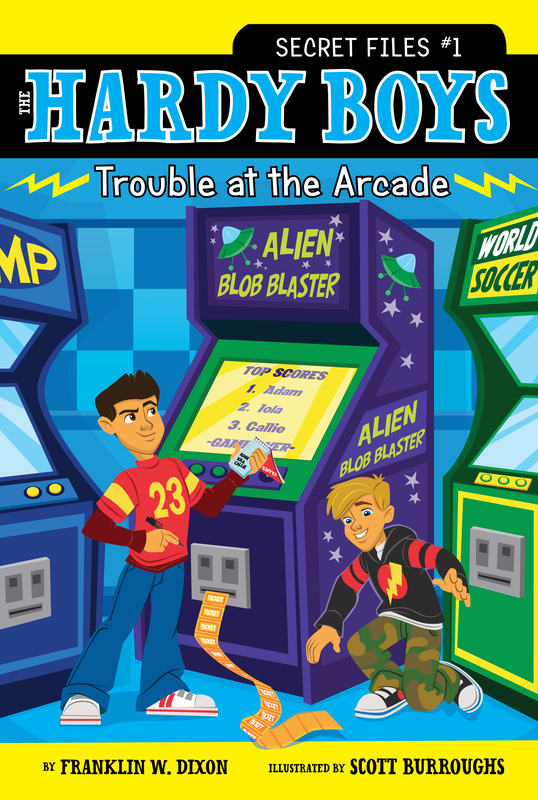 Trouble at the Arcade 1 Alien Attack! All humans will be destroyed!” a metallic voice rang out. Nine-year-old Frank Hardy gasped as yet another row of hideous aliens appeared over the horizon. There was no question about it. Earth was being invaded! “Ha!” he shouted, and his dark hair fell in his eyes as he dodged a laser blast by doing a somersault through the air. Then he ducked around a huge pile of rocks. Oh no! There were more aliens behind the rock pile. And these were even worse. They were spitting horrible blue goo! BLURP! A wad of goo came flying at Frank. He jumped up and did a flip in midair to avoid the goo. Then he karate-kicked a rock. It crashed down on one of the aliens. SPLAT! Blue goo spurted everywhere. For a second Frank thought one of the aliens was calling him. Then he realized it wasn’t an alien. It was his mother. He blinked and looked up from the video game console. His mother called his name again. He set down the controls and walked out to the top of the stairs to see what she wanted. He went out the back door and crossed the lawn, heading toward the woods at the back of the yard. Before he got there, he looked around carefully. There were hedges on both sides of the yard, so none of the neighbors could see him. The sound of hammering was coming from the spare room over the garage. Mr. Hardy had been working up there for weeks during his free time. But Frank couldn’t see his father through the window, so he guessed his father couldn’t see him, either. Frank ducked into a narrow path between two bushes. It looked like a trail that nothing but a deer or a rabbit would use. But it actually led straight to the tree house Frank and his younger brother Joe had helped their parents build in the woods. No one except the two of them (and their parents) knew the tree house was there. The tree house was halfway up a huge old maple tree. Frank and Joe had painted the bottom of the platform green and brown. That way, even if someone walked right past, they probably wouldn’t notice it. At least not most of the time. Right now anyone passing by would definitely see it. That was because Joe had left the ladder hanging down. The ladder was made out of rope and planks. It had a pulley system so the boys could keep it rolled up out of sight whether they were in the tree house or not. Frank grabbed the ladder and started to climb. Soon he was peering into the tree house. It was one big room inside. The back wall was the trunk of the tree, and the front wall had the door and a window cut out of it. One of the side walls was covered with posters from martial arts and monster movies, and the other had a dry-erase whiteboard where the brothers could leave notes for each other. There was no real furniture, but there were some cushions to make sitting on the floor more comfortable. Adam Ackerman lived on the other side of the woods. He was in Frank’s class at school and was known as the meanest bully in Bayport. Frank frowned. Joe was always saying stuff like that. “Okay.” Joe tossed the comic book he was reading into the messy pile beside him. Then the two boys climbed back down the ladder and used the pulley to lift it back out of sight. That was why Frank had been playing Alien Blob Blaster. The tournament was being held at the grand reopening of the arcade at Bayport Fun World. The grand prize was a brand-new superdeluxe game system. Frank could tell that Joe was sure he was going to win. That made him kind of mad.